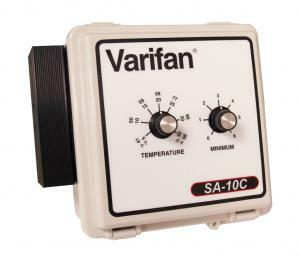 Vostermans Ventilation has Varifan IC-Series in the delivery program. This series of intelligent controls can be programmed with custom-made application software. This allows the customer to define the use of inputs and outputs. 6 inputs, 8 outputs. 2 variable stages, 4 Multifan relays and 2 module ports with optional variable speed, curtain or on / off modules. Able to network with other IC controls or computers. Time delay alarm relay. User friendly interface with easy to read LED display, list of parameters and list of outputs with LED to show active outputs. Customizable logic to adapt to your needs. 6 stages-2 variable stages and 4 on/off stages (10 AMP), expandable to 10 stage, variable or on/off, by adding up to 2 modules. Customized programmable logic to fit your application. Adds variable speed stages to IC68, IC610 or MSC10 controls. Adds curtain control to IC68, IC610 or MSC10 controls. Ramping temperature reduction per day feature. Hi / Lo temperature records to monitor room temperature to help control LP use. Alarm contacts to trigger in case of Hi / Lotemperatures, loss of power or a defective control. 1 heater or on/off relay, 1 on/off relay for additional fan, drip system, etc. Will manually control speed of 1 or a group of variable speed fans. Mechanical thermostat with single pole and 2-way on/off switch. Will automatically control speed of 1 or a group of variable speed fans based on set minimum speed and temperature. Internal switch to have fan shut off below set point. 2 control knobs: 1 for desired temperature and 1 for idle speed. Hi / Lo temperature record and alarm contact. Replaces Honeywell thermostat for AT-Newell Curtain Machines.